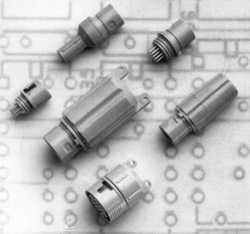 WPI Viking THORKOM connectors have been used in a broad variety of commercial and industrial applications. Some of these include: computer equipment, medical instrumentation, automotive, communications, marine, aviation, process control, audio equipment, consumer electronics and agriculture. Viking THORKOM connectors are available in various shell sizes, backshell, strain relief, high density contact arrangements and mounting styles. Available in various shellsizes, high density contact arrangements and mounting styles. Quick connect and disconnect with either POSI-LOK or V-LOK coupling. "High temperature resistant" thermoplastic for autoclaving processes. Durable and competitively priced screw machined contacts. Screw machined dip solder contacts. Various backshell and strain relief options.